November saw a spate of deadly terror attacks in Lebanon, France, Nigeria and Mali. 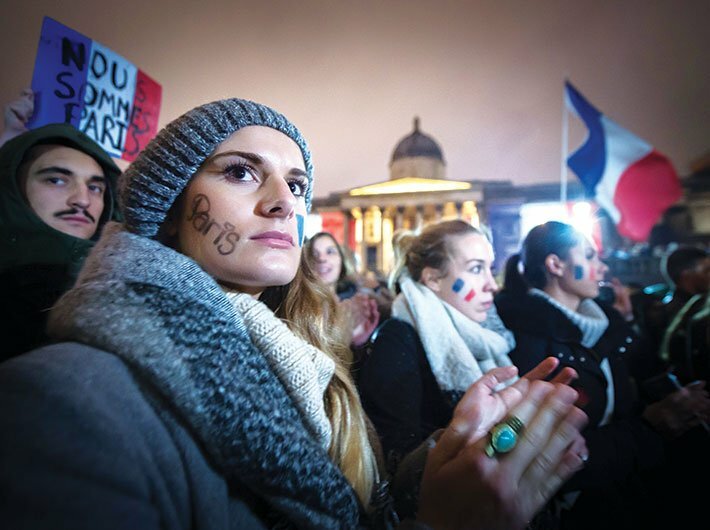 The Paris attacks grabbed international headlines with an overwhelming outpouring of global sympathy. The attacks in Paris on November 13, that struck a bustling concert hall, a café, a restaurant and a football stadium, killed 130 people and injured hundreds others, reinforced uproar against the flow of refugees and safety of the western world. The Global Terrorism Index (GTI) 2015 released on November 17 – a 111-page detailed analysis of the changing trends of terrorism in 2014 in 162 countries – busts some of the myths that have spawned around terrorism rampant not only in social media but have been highly influential in informing countering violent extremism (CVE) policy. The report highlights the countries most at threat, the locations of terrorist activities, whether our policies of countering violent extremism have resonance with the root causes of terrorism and how far popular perceptions belie common biases rather than facts backed by data. The Index is the third in a series of annual reports produced by the Institute of Economics and Peace that analysed data from Global Terrorism Database – one of the most comprehensive sources of information about terrorism. The GTI defines terrorism as “the threatened or actual use of illegal force and violence by a non-state actor to attain a political, economic, religious, or social goal through fear, coercion, or intimidation”. Over and above the baseline data, two of the three criteria should be met to be categorised as a terrorist attack: (1) The violent act was aimed at attaining a political, economic, religious, or social goal, (2) The violent act included evidence of an intention to coerce, intimidate, or convey some other message to a larger audience other than to the immediate victims, and (3) The violent act was outside the precepts of international humanitarian law. The total number of deaths in 2014 from terrorism increased by a whopping 80 percent from the previous year and shows a nine-fold increase since the beginning of the 21st century – there were 3,329 deaths from terrorism in 2000, 18,111 in 2013 and 32,685 deaths in 2014. It was, by far, the deadliest year for terrorist activities resulting in deaths. However, the distribution of terrorist activities remained highly skewed. They are concentrated in just the five countries of Iraq, Nigeria, Afghanistan, Pakistan and Syria which account for 78 percent of the lives lost and 57 percent of all attacks in 2014. However, terrorism, from the findings of the report, seems to be spreading its tentacles fast with the lethality of attacks getting worse in 2014 and a 120 percent increase in the number of countries that recorded over 500 fatalities. Twenty-seven countries had a decrease in the number of deaths from terrorism from the previous year, offset by 48 countries that recorded an increase. But it is important to note that these 48 countries that have witnessed a terrorist activity expansion are mostly in Africa. These attacks are not located in the West as is widely perceived to be the case. So the number of countries experiencing more than 500 deaths increased from five to 11 in 2014 with the six new additions being Somalia, Ukraine, Yemen, Central African Republic, South Sudan and Cameroon. Most of the world did not have a death from terrorism though the number of terror-hit countries with at least one death, increased by eight pushing the number to 67 in 2014. Nigeria saw a major intensification in terrorist activities and the biggest increase in deaths related to terrorist attacks ever recorded by any country with a spike of over 300 percent and 7,512 fatalities. Boko Haram, an Islamist group which has pledged allegiance to ISIL (also known as Da’esh or Islamic State) and operates from northern Nigeria, has become the deadliest terrorist group in the world in terms of the fatal impact. There were 17 countries that passed the 250 threshold for fatalities in 2014, up from nine countries in the previous year, but these countries are again located mostly in Africa (and China) rather than in the western hemisphere. Some countries such as Cameroon and Ukraine saw relatively new terrorist footprints while for countries such as the Central African Republic, China, the Democratic Republic of the Congo, Kenya, Libya, South Sudan and Sudan, there was an aggravation of already existing terrorist activities. Of the 162 countries included in the GTI, 69 did not suffer any attack. However, the spread of terrorism is increasing. In 2014 there were 93 countries that had a terrorist attack, up from 88 in 2013 and 81 in the previous year. There was also an increase in the lethality of attacks from 2013 to 2014. In 2013 there was an average of 1.8 deaths per attack. In 2014 this jumped to an average of 2.4 deaths per attack reaching the highest level of lethality since 2007. Conservative estimates peg the economic cost of terrorism at its highest-ever level in 2014 at $52.9 billion. Is the West under threat? “The majority of deaths from terrorism do not occur in the West,” states the report. The US has featured only once in 2001 as a country with the highest number of terrorist fatalities as opposed to other countries that have consistently featured among the top countries for terrorist activities, including India (see below). If one counts the 9/11 attacks, only 2.6 percent of deaths from terrorism have been located in the West and if we were to exclude the 9/11 attacks the percentage drastically falls to 0.5 percent. Iraq and Nigeria have taken the biggest hit in terms of loss of human lives resulting from a rise in global terrorism. The countries account for 53 percent of all deaths from terrorism in 2014. “The levels in Iraq are the highest ever recorded in a single country with 9,929 deaths, an increase of 55 percent from 2013,” states the GTI. To put matters in perspective, in 2014, there were three times as many deaths in Iraq than the deaths in the entire world in 2000 and more than the cumulative fatalities globally between 1998 and 2000. The US-led invasion of Iraq in 2003 marks the beginning of the increase in death toll from terrorism in Iraq, spiking in 2007 with a surge in US troops in Iraq, falling by 56 percent thereafter, only to reach a record high number of deaths in 2014 with the rise of ISIL. Nigeria, on the other hand, saw the biggest year-on-year increase in terrorism on record in 2014. Over 50 percent of the attributable deaths were caused by ISIL and Boko Haram – the latter organisation works exclusively in only three countries in Africa – Nigeria, Cameroon and Chad. In the GTI ranking system, where ‘10’ represents the highest impact of terrorism and ‘0’ represents no impact of terrorism, the ratings of the seven most-impacted countries are: Iraq (10), Afghanistan (9.233), Nigeria (9.213), Pakistan (9.065), Syria (8.108), and India (7.747). There are ten countries, including the US, with the highest levels of fatalities for only one year out of the last 15 years. There were 22 countries which were in the group for at least 12 years. Afghanistan, Iraq and Pakistan have all been ranked in the ten countries with the highest number of deaths from terrorism for every year in the last ten years. Somalia has been a top ranking country for terrorist-related fatalities for the past eight years in a row. India has consistently featured as the top victim of terrorism for 14 years now – the highest for any country. Pakistan was the only country in the ten most impacted countries that saw a decline in deaths. Compared to 2013, the number of people killed in Pakistan came down by 600 in 2014. This is in part due to the further fracturing of the Tehreek-i-Taliban following the death of its leader Hakimullah Mehsud in November 2013, rather than any improvement in internal security. Russia also reached its lowest levels of terrorist activity since 2007.
Who is attacking whom and why? The report categorically refutes the perception that Islamic fundamentalism is the main cause of terrorism in the West, as more than 70 percent of deaths since 2006 have been caused by lone wolf terrorists. “Additionally, Islamic fundamentalism was not the primary driver of lone wolf attacks, with 80 percent of deaths in the West from lone wolf attacks being attributed to a mixture of right-wing extremists, nationalists, anti-government elements, other types of political extremism and supremacism,” reveals the GTI. There has been a 172 percent increase in the deaths of private citizens. However, majority of the terrorism-related deaths do not occur in the West. Meanwhile, in 2014, there has also been an 11 percent decrease in deaths of religious figures and worshippers. The recent attacks in Paris saw a renewed anger against refugees not only on social media but also in reactions of political leaders following the attacks. French president Francois Hollande declared a state of national emergency and closed the country’s borders. The findings of the report for 2014 – which presumably will hold true for current times – show that the real danger lies in the reverse flow of foreign fighters into Syria that continued in 2014 and 2015, rather than Syrian refugees entering the West. Since 2011 between 25,000 and 30,000 western-bred fighters across 100 countries have arrived in Iraq and Syria. 7,000 new recruits have arrived in the first half of 2015 – about 21 percent of fighters are from Europe while 50 percent are from Middle East and North Africa. Refugees are victims of terrorist attacks rather than perpetrators with ten of the 11 countries that had more than 500 deaths from terrorism also had the highest levels of refugees and internally ?displaced? ?migration in the world. The Syrian conflict alone has four million people migrating out of the country while seven million people are internally displaced within the borders of the country. The GTI states that “without an international agreement on the future of the Assad regime it will be very difficult to effectively combat ISIL. Any solution to ISIL must be inclusive of the Sunni population and have regional support, otherwise the sectarian violence may continue for decades”. However, contrary to this recommendation, France is now directly funding the anti-Assad rebels through money for buying weapons supplied by its proxies and thus aggravating the civil war situation in the country, reports the Guardian. “The research finds that 92 percent of all terrorist attacks over the past 25 years occurred in countries where state-sponsored political violence was widespread, while 88 percent of attacks occurred in countries that were involved in violent conflicts. The link between these two factors and terrorism is so strong that less than 0.6 percent of all terrorist attacks have occurred in countries without any ongoing conflict and any form of political terror,” states the report. The report also concludes that there are different causes that aggravate terrorism for OECD (Organisation for Economic Co-operation and Development) and non-OECD countries. In the western countries, socio-economic factors such as youth unemployment, confidence in the press, belief in democracy, drug crime and attitudes towards immigration are the most statistically significant factors correlating with terrorism, states the report. “This highlights many of the underlying drivers of radicalisation and lone wolf terrorism,” adds the report. “Lower respect for human rights, the existence of policies targeting religious freedoms, group grievances, political instability and lower respect for the UN or the EU” are aggravating factors common for both OECD and non-OECD countries. Extraordinary legal measure have been taken in France after the November 13 attacks with the police conducting searches without warrants and and suspects being put under house arrest at random. The Muslim community is feeling increasingly alienated “instigating tension with a Muslim population – the largest in Western Europe – that has already long felt aggrieved and second class”, reports the New York Times. Such extrajudicial recourse will only aggravate matters in the form of weakening belief in the system rather than having an ameliorative effect on radicalisation. Factors such as a history of armed conflict, ongoing conflict within the country, corruption and a weak business environment are predominant for fostering a conducive environment for terrorist activities. India is the only country in the GTI that has consistently for the last 14 years featured among the top ten countries impacted by terrorism. It scores a 7.747 in the GTI and ranks sixth in the world – between Syria and Yemen. India ranked far above Libya, Lebanon, China, Russia, Israel, Mali, Algeria, US, France and UK in the GTI score. Only in 2014 India did not figure in the list of top ten countries impacted by terrorism but this is not due to any improvement in the political security of the country, the report notes – in fact, India had a slight increase in terrorist deaths in 2014 with a total death toll of 416 – but because other countries suffered terrorist attacks more than India. 2014 saw the highest number of terrorist incidents and deaths since 2010. However, in spite of the frequency of attacks most of them result in low casualties and are a result of domestic problems rather than having an “external” cause. The GTI categorises terrorism in the Indian territory in three distinct groups: communists, Islamists and separatists. “Communist terrorist groups are by far the most frequent perpetrators and the main cause of deaths in India. Two Maoist groups claimed responsibility for 172 deaths in 2014, which constitutes 41 percent of all deaths from terrorism,” states the report. The majority of Maoist attacks occurred in Bihar, Chhattisgarh and Jharkhand. The dispute with Pakistan over Jammu and Kashmir resulted in far fewer deaths compared to deaths caused by Maoist groups – they constituted 14 percent of the total deaths in India from terrorism. There has not been a dramatic increase in terrorism in spite of the announcement by al-Qaeda to set up a presence in the area. The two deadliest Islamic terrorist groups in 2014 were Lashkar-e-Taiba (LeT) and Hizbul Mujahideen. The National Democratic Front of Bodoland (NDFB) was the second deadliest group in India that killed 80 people in 2014, up from seven people in 2013. The proclivity to blame refugees and link them with increased terrorist attacks in the West is the classic logical fallacy of mistaking a preceding event as a cause. Such mistaken notions lead to highly faulty solutions. Moreover, unless we have a realistic understanding of the root causes of terrorism, for instance, continue fueling an internal conflict, or giving a real or perceived impression of intolerance, thereby alienating certain communities, we are only falling into a deeper terror abyss. Solidarity with the French is definitely essential but the need to objectively understand the propelling factors for terror activities is not only the more ethical but also the more prudent thing to do.